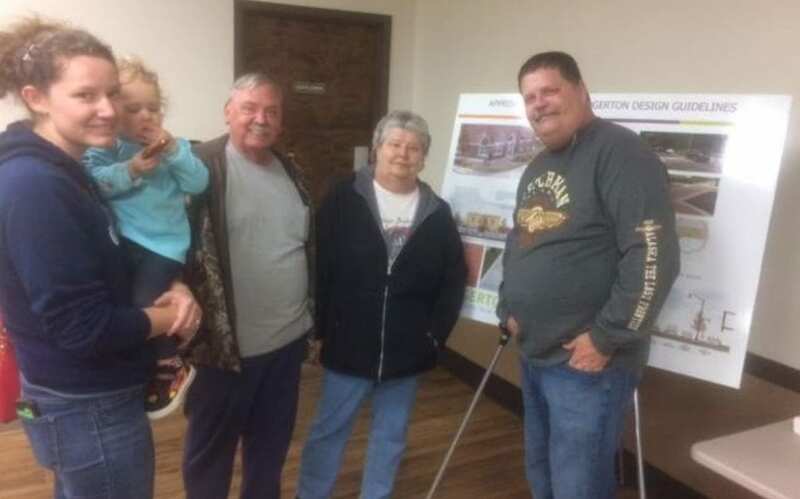 Edgerton residents attended an open house on a proposed “Greenspace” Community Center. During the April 4 event at city hall, residents met with city officials and staff and discussed ideas on what they would like to see at the center. The city has set aside $4.1 million for the center which will be located on a vacant lot between the Edgerton Bank of Knowledge and the fire station. According to Beth Linn, city administrator, the proposed building will include at least two floors of approximately 15,000 sq. ft. each with the possibility of a basement. Construction could begin as early as late August, 2019. Among activities proposed during the event are a gym, a conference room, offices, an indoor sports facility for basketball, volleyball and other indoor sports, and a shelter in the basement. During Edgerton’s State of the City address on Feb. 21, Don Roberts, mayor, announced plans for the city to build a new gathering place. “Both the Downtown Edgerton Plan and the Parks Master Plan confirm what residents have always known. The Greenspace is the right place for the city to build a new gathering place for our community,” he said. Currently the Greenspace is used for such events as the Mayor’s Christmas tree and the auction during Edgerton Frontier Days event. Roberts said the facility, when completed, would offer space to host community events such as Senior Lunch, Boy and Girl Scout meetings, and visits from Santa. It would also serve as an emergency shelter during inclement weather. He said that last year the city conducted a community survey in which 200 households participated and identified streets, trails and parks as areas the city should prioritize. “This feedback from residents has driven significant investment in these quality of life areas over the last several years including an aggressive annual street maintenance program and the upgraded park amenities,” he said.